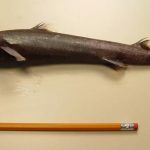 University of Rhode Island shark researcher Bradley Wetherbee discovered a new type of Lantern shark while doing his doctorate in the 1990s, but it’s only in the last few years, almost 30 years later, that he’s been able to give that shark a name. And he named it after his daughter. 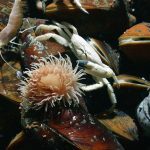 Four decades have passed since vibrant clusters of giant, metre-long tubeworms, discovered at hot springs on the ocean floor by Corliss et al.1, were reported in Science. Until then, the ocean floor was considered to be more like a desert than an oasis. Corliss and colleagues didn’t discover underwater hot springs by accident; rather, they were trying to discover whether the hypothesis that such sites existed was correct. 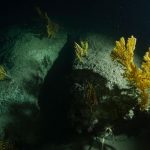 Theories on the movements of tectonic plates had set the course for this discovery with the idea that the mountain ranges that girdle the globe on the ocean floor, called spreading centres, are volcanic sites at the boundaries of tectonic plates. A key clue to the existence of underwater hot springs was the unexpectedly low conductive heat flux in the ocean’s crust2. Convective heat flow through hot springs could solve the riddle of this missing heat. Warm-water anomalies documented above a spreading centre called Galapagos Ridge guided Corliss et al. to the site at which they discovered underwater hot springs (also called hydrothermal vents). 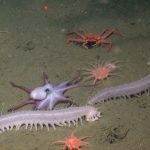 The UN has described the deep sea as “the largest source of species and ecosystem diversity on Earth.” Life thrives particularly on the vast expanses of sea floor known as abyssal plains, amid the submarine mountains that rise from them and around superheated springs. Extremes of temperature and pressure have proved no obstacle to the creatures here. But plans to commercially mine the seabed pose a grave threat to their survival. It felt a lot like a moon landing to the researchers who experienced it—descending thousands of feet below the surface of the ocean into complete darkness. Ambient ocean light extends down only about 600 feet. After that, no amount of straining your eyes will help you see through the inky blackness. 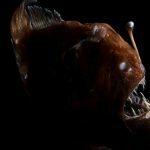 Scientist Tim Shank and photographer Luis Lamar were descending into Lydonia canyon, one of several among the canyons and underwater mountains sitting 130 miles from Massachusetts, when they were slowly surrounded by darkness. An enormous shark ”nursery” swarming with the predatory fish and strewn with their eggs has been found in the waters 200 miles off the western Irish coast. 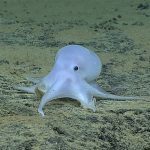 The rare discovery was made by a remotely operated vehicle exploring the region’s cold-water coral reefs at depths of around 750m. 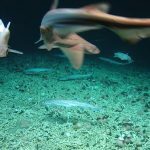 Scientists observed a large school of blackmouth catsharks, a relatively small species found throughout the northeast Atlantic, alongside the more unusual and solitary sailfin roughshark. When Luiz Rocha, a fish biologist at the California Academy of Sciences, goes scuba diving, he tacks on one and a half times his body weight in specialized diving gear. 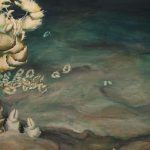 Once he submerges, he can’t spare a moment to take in the vibrant corals just beneath the surface — he has greater depths to plumb. 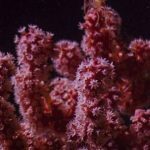 Rocha is headed toward what Smithsonian Institution fish biologist Carole Baldwin calls “a very diverse and productive portion of the tropical ocean that science has largely missed”: mesophotic reefs. “Mesophotic” is Greek for “middle light,” referring to the intermediate amount of sunlight that can penetrate to depths of 30 to 150 meters (100 to 500 feet) below the ocean’s surface. 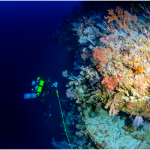 Continue reading Are deep sea reefs really a lifeboat for our vanishing corals?